Years ago, I had all these ideas about retreats I wanted to lead, unique classes I wanted to design, food I wanted to offer, and the overall experience I wanted to deliver to people. I had a vision of the final product I wanted to create, but I couldn't figure out how to get there. Where was I supposed to start to make this dream a reality? Google, for once in its existence, wasn't helpful. It was as if no one was willing to share their secrets. I found a couple articles from yoga publications vaguely talking about what's required to run a retreat, but they were so obvious that they weren't helpful. So today I'm confessing the lessons I've learned. Maybe it'll help someone out there with a dream but no idea where to start. 1. Have a dream, but keep it within reach. First and foremost, design an event that is exciting to you, but realistic in terms of what you can handle. A confession: My dream would be to bounce around from place to place leading weekend workshops or week-long retreats here and there. But I quickly realized that wasn't realistic for me (yet!) because of the insane amount of work it takes to just put on one small event. Even just an afternoon workshop takes so much work, that if I were doing weekend events twice a month, I would be so burnt out from the behind the scenes stuff that I wouldn't do well on the mat as the instructor. All my energy would be spent doing the logistics. 2. Often, you'll need to spend money to make money. What costs? Pretty much everything. A confession: Everything costs. And it isn't easy (at least for me) to plunk down that initial investment money. Because it's a gamble. I don't know how many students (if any!) I'll be able to attract, and there's that self-doubt that comes into play when I'm about to enter my credit card information to pay for the venue space. -If you're holding your event at a yoga studio, you'll need to rent the studio space. The rates vary depending on the city. I've paid $25/hr and I've paid $100/hr, and a lot of studios have a two or three hour minimum. -Cost of insurance. As an instructor, I highly recommend insurance. Many studios will require you to list them on your insurance policy. -If you're holding a longer event, like a retreat, you'll need to pay for the venue up front (and often times there is a no-refund policy, in the off chance that no one signs up). -Holding a pop-up yoga class? Color printed fliers on quality paper can run upwards of $50 or $100, depending on how many you order. 3. Hustle to get the word out. Regardless of whether you're putting together a yoga class or a yoga retreat, once your promotional graphics and fliers are created, it's time to roll up the sleeves and get to work. A confession: It's illegal in certain cities to attach fliers to city property like streetlights and telephone poles (you'll be fined), so one day I spent all afternoon (remember, it's LA, an hour takes you about five miles) driving to every Whole Foods that popped up on my GPS so I could post fliers on their public bulletin boards (located between their bathrooms, you're welcome!). It is a hustle trying to get the word out about your event and since those fliers cost money, it's important to consider the most appropriate space to reach the type of people who might want to come to your event. For example, I wouldn't ask to hang a poster at the fancy nail salon in town if I'm holding, say, a Camping Yoga Retreat Weekend (and let's be clear, I wouldn't ever do that because I went camping as a kid once and woke up with giant white (!!!!) spiders all over me). Instead, it's probably a better bet to ask at the local REI or Patagonia stores. Aside from printed flyers, there's also the option to research yoga event databases with a huge mailing list or strong social media presence. Their prices are usually through the roof (I was quoted $500 for one tiny ad space for one month on a yoga website), and before you spend the money, be sure to research their stats to ensure they're even getting traffic otherwise you're just spending money for your pretty graphic to sit there unseen. Yeah! You've got people to sign up for your event and it's almost time to get the show on the road. Now what? A confession: I'm so grateful to have my logistics/planning/design guru Sophie for my retreats abroad. She's worked in PR for ages, so she is super detail oriented and knows how to get stuff done. She does planning and production and everything in between. I am not sure I could do it alone and still have the energy to lead a good yoga program for the week. -inform yourself: be familiar with what there is to do in the area, have vendors that you trust like massage therapists or manicurists who can come to the venue for private sessions should a student request an appointment, have recommendations for restaurants to try, the best beaches, the cute little shops off the tourist path, etc. Cuz people came to get their asana on, you know? A confession: I spend hours on each yoga class I create for my yoga retreats. I want the playlists to work well with the sequence of the class (there's nothing worse than bringing the students down to the mat to begin a relaxing sequence when some up-tempo music pops on), and I want each class to have a pose or flow we work up to so I need to make sure their bodies are prepped. I like each class to feel different, so I try incorporate different props, different themes, unique, playful sequencing. I sometimes like to incorporate partner work toward the end of the week when people have gotten to know one another. I like to create super slow yin classes and really powerful flow classes. These are all planned out in advance and I try the sequence out myself ahead of time so I know how it feels in the body. My biggest piece of advice is to plan further in advance than you think you need to. Being prepared is so important. -know your playlists inside and out. This will help with timing of your sequencing. -offer a variety of classes unless you've promoted the retreat as a yin yoga week or power yoga week, etc. 6. There's no such thing as down time. Most retreats having a yoga class in the morning and a yoga class in the evening, with the whole middle part of the day off so the students can explore or hang by the pool and relax. It's a vacation for them, you know? But as the instructor, it's obviously important to always remain available for things when they come up. If I'm the only person running the retreat, I wouldn't go off snorkeling for the day (unless we were all going snorkeling). Someone needs to be there even during the "down time". Some instructors I know only arrive for the classes and leave immediately after. I have heard of other instructors who eat separately from the students and in silence so that they can decompress. I have heard of others who treat it like it's a vacation for them, too, and then are unavailable when students need help. You'll need to decide what avenue you want to take. For me, I eat with the students and take the "free time" to work and focus on my next class, but I usually remain at the property during this free time so that I am available when a problem arises (and they usually do, more on that in a sec). When I have someone like Sophie with me, we coordinate who will be at the venue so there is always someone there to help if need be. A confession: Yoga retreats can be really transformational for people, and as an instructor, people sometimes will open up to you. They'll tell you some deep, dark stuff. And I don't always (read: ever) know the "right" thing to say. I don't have the answers. I know I don't have to have the answers, but I wish I had the answers, you know? When someone is hurting or revealing something big to you, it's nice to know what to say. This kind of weighs on me, this feeling of not knowing the best thing to do or say. It's part of the job, being available to listen and help where you can, but it can be tough..unless you're one of those people who always knows the right thing to say (in which case, teach me your ways). I can't really beat around the bush here. No matter how much you prepare and plan, problems pop up beyond your control. The electricity might go out, or someone might get sick. You might get sick. Whatever it is, as the leader, you've just got to deal with it (in a professional way!) and find a solution as quickly as possible. A confession: We had a plumbing issue in a student's room at one of the retreats I lead. I was super concerned about it, fearing the worst - that it wouldn't be fixed in time, but with just a quick phone call to the house manager, the plumber was there and the situation was resolved in under an hour. It pays to make sure the management team you're working with is on top of things! Psst, all the hard work pays off. The real joy here is the people you meet. I firmly believe everyone I meet knows something I don't, and so spending time with the people who come to the retreat is an opportunity to connect and learn and grow and make memories. There will be laughter and tears (probably good tears, though), and the best memories will be made. A confession: It isn't easy to produce these types of events, but I find them so rewarding and worth the effort. The connection with the students that I get to make is so much more profound than a single afternoon workshop, and I love that we get to do yoga and spend time together in beautiful surroundings. I get emotional when I look back on events - how they started from just a little idea, each blossomed into a beautiful event, and now are forever in my heart. 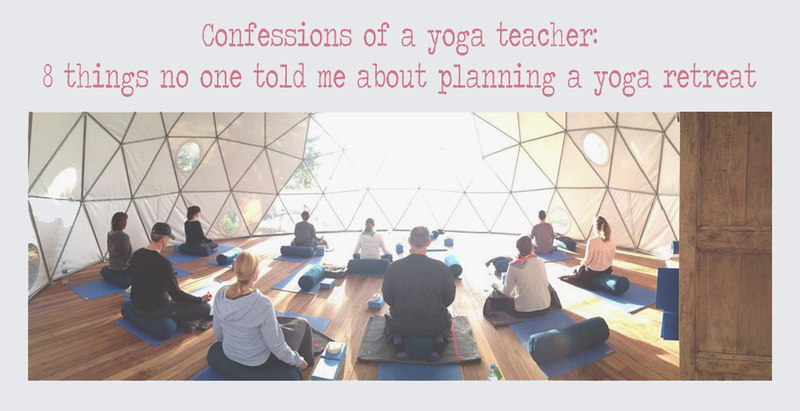 Related: 9 things they don't tell you in yoga teacher training and how to choose a yoga retreat. Have you ever been on a yoga retreat? Would you like to? If you're an instructor, what did I forget to add here?